The "Eternal fire – Yanartas" and the remains of the mystical ancient city of Olympos are both easily reached by foot. The Lycian Way, a 580km long-distance footpath through the Taurus mountains from Fethiye to Antalya, also passes through Çıralı. 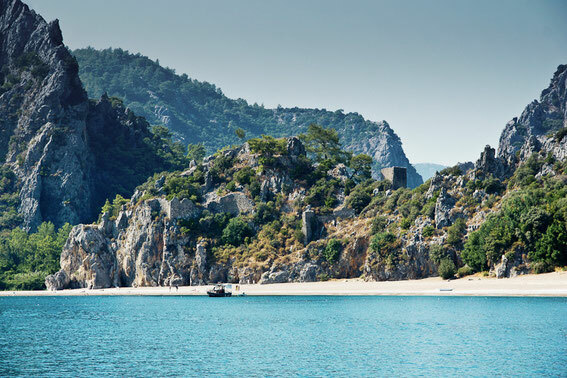 One can undertake various day-trips on the Lycian Way, and it's proximity to the coast for long stretches affords wonderful sea views and the opportunity to escape to secluded bays. Boat trips You can take an unforgettable boat trip on the pension's own boat, "Nazar". Trips can be arranged on a group or individual basis for one or more days. Trips to Antalya can be arranged with the Dolmuş; a minibus which forms the basis of public transport here. Excursions are also possible to Phaselis, Göynük Canyon or Termessos. 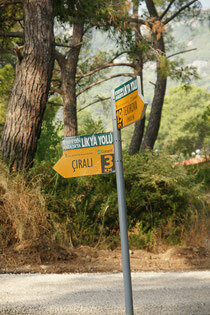 Either we can take you there or we can arrange a hire car for you in Çıralı.